Jade is said to bless whatever it touches, serving mankind across the globe for nearly 6,000 years. For primitive peoples in the British Isles, its toughness, and ability to polish and sharpen made it a favored stone for axe heads, knives and weapons. Indigenous tribes of Mexico, Central and South America, and New Zealand carved it into deity masks and ritual artifacts, even cast it into wells as an offering to the water spirits for fresh and plentiful water. Jade has been the most highly esteemed stone in China throughout recorded history, and was valued for its beauty and powers of healing and protection. An endless variety of gems, vessels, incense burners, beads, burial items and statues have been wondrously carved from Jade, as well as musical instruments and pendants inscribed with poetry. Jade is most valued for its metaphysical properties. It is the ultimate "Dream Stone," revered in ancient cultures, as well as today, to access the spiritual world, gain insight into ritualistic knowledge, encourage creativity, and dream-solve. It is cherished as a protective talisman, assuring long life and a peaceful death, and is considered a powerful healing stone. An amulet of good luck and friendship, Jade signifies wisdom gathered in tranquility, dispelling the negative and encouraging one to see oneself as they really are. In scientific terms, Jade is the name shared by two distinctly different minerals - Nephrite, a calcium magnesium silicate, and Jadeite, a sodium aluminum silicate. Though they have different compositions, hardness's, densities and crystal structures, both are exceptionally tough stones, similar in appearance, and equally valuable in metaphysical properties. Both occur in the beautiful olive shades we've come to recognize as jade green, but have some distinctions. Nephrite generally occurs in creamy white, mid- to deep olive green, brown and black. It has a smooth surface polish with a waxy sheen and is more commonly found. Jadeite may be a white-gray green, leafy green, blue or blue-green, emerald green, lavender, pink, red, orange, greenish-black or black. 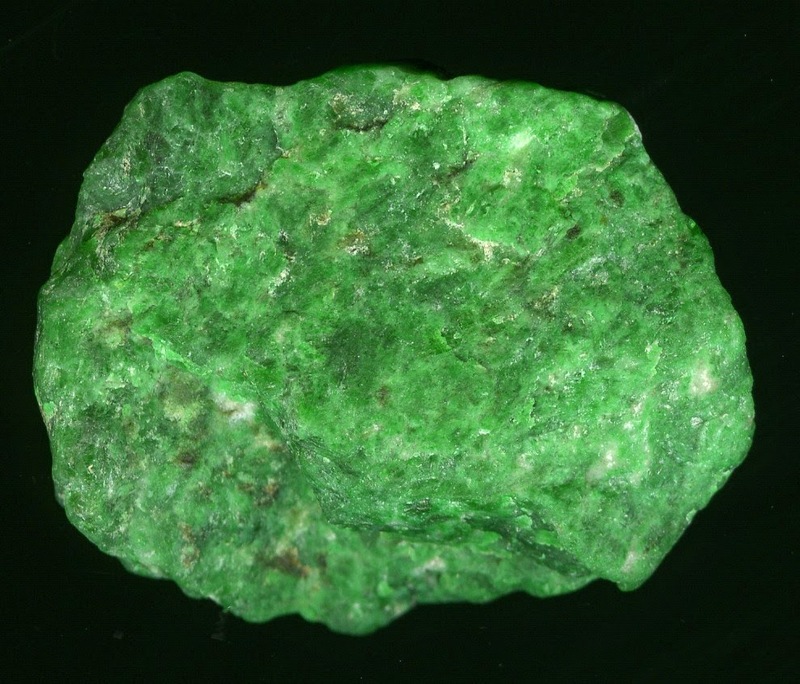 It is hard and lustrous, rarer than Nephrite, and usually more expensive. Translucent, emerald green Jadeite, colored by traces of chromium, is called Imperial Jade and is the rarest and most valuable. The name and character of Jade is associated with many cultures, all referring to its reputed medicinal property of curing calculus stones and disorders of the kidneys or bladder. Yu-Stone to the ancient Chinese, it was called "spleen-stone" by the Mesoamericans. Nephrite is from the Greek word nephros, the kidney. The Spanish named it Piedra de hijada when they conquered the New World (lapis nephrictus in Latin), meaning "Stone of the loin," or "Stone of the flank." In a later French translation, the term was misprinted and became "pierre le jade." Jade is the stone of calm in the midst of storm. Its action balances nerves and soothes cardiac rhythm. A piece of Jade kept in a pocket or on a pendant to stroke from time to time recharges energy, and traditionally guards against illness. Jade may also be used to temper the shock or fear of the very young or very old being cared for in the hospital or away from home and family. Jade is excellent for healing feelings of guilt, and for extreme cases of defeatism. It also treats "pathological normality," an excessive desire to adapt oneself to a group, even if it is sect-like, exaggerated militarism, a follow-the-leader attitude, or the compulsive desire to give in to general opinion to belong no matter the cost. 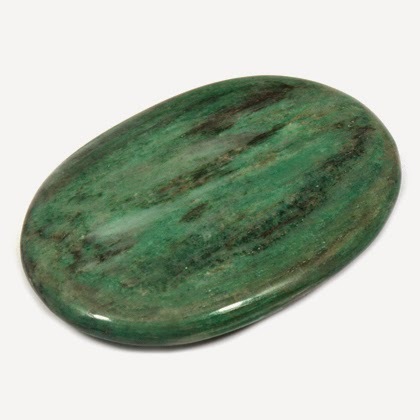 As a travel stone, Green Jade prevents illness while on holiday, is beneficial for those traveling alone, and protects children and pets from straying or being hurt while on a journey. Green Jade also fosters chi, or Life Force energies, and is excellent for hiking, gardening or relaxing out of doors. Green Jade is a crystal of love. It is supportive of new love, and increases trustworthiness and fidelity. It also inspires love later in life. As a professional support stone, Jade aids doctors, nurses, veterinarians, and all healers in making practical diagnosis and in their applications. It is a support stone for educators, and Jade, carved in the form of a faith symbol, is uplifting to military personnel. Jade pendants and necklaces protect against deception and authoritative abuse for financial or sexual gain. Jade signifies peace through strength, and is also helpful in homes or occupations that encounter bullying or intimidation from violent children or teens. Jade is a powerful cleansing stone, enhancing the body's filtration and elimination organs. It is excellent for treating the kidneys, spleen and supra-adrenal glands, removing toxins and balancing the fluids and water-salt/acid-alkaline ratios in the body. It is helpful to the bones and joints, especially the hips, and for treating bacterial and viral infections, cystitis and genito-urinary infections, and bed wetting. Jade has a restorative property, allowing for both the cellular and skeletal systems to re-bind themselves, and assists in the removal of pain associated with the body's healing of itself. Jade also helps stitches to bind and heal properly, and has been used to diminish cramps and "Charlie horses." Imperial Jade is particularly useful in healing after plastic surgery or reconstructive surgery caused by a disfiguring illness or injury. Jade is thought to treat reproductive disorders, especially male, and assist during childbirth. Jade may also be used to help teenage girls with anorexia, and for mothers who are afraid of not knowing how to parent their children. Jade is a "dream stone," releasing negative thoughts and irritability and soothing the mind. It stabilizes the personality, integrating mind with body, to stimulate ideas and make tasks less complex and easier to act upon. Placed on the forehead, it brings insightful dreams. Jade improves one's remembering of dreams and releases suppressed emotions via the dream process. Jade relinquishes self-imposed limitations and assists in cherishing one's ideals and desires, facilitating the ambition and building of those thoughts into physical reality. Jade provides confidence and self-assuredness, self-reliance and self-sufficiency. Imperial Jade improves dysfunctional relationships. It helps restore dignity to anyone who has been mocked for looking different, and gives very overweight people stuck in self-loathing the courage to seek help and persevere with treatment. Jade in all forms has always represented nobility, not only of rank, but of ideals. The wearing of Jade assists in creating magic for the highest good and in protection from harmful or deceitful entities during spirit work. Green Jade is an abundance stone, representing the flow of Divine energy into the reality of one's life. It brings harmony and happiness in business and family relationships, as well material abundance. It is a reminder to smell the flowers, touch the ones you love, and share your heart with others in affirmation of plenty. Green Jade is a "growth crystal" - a powerful conduit of the earth's Life Force of birth, development, and creation, and of the power of nature's constant renewal. It is a potent aid in nurturing, whether of fledgling family relationships or a new business venture. 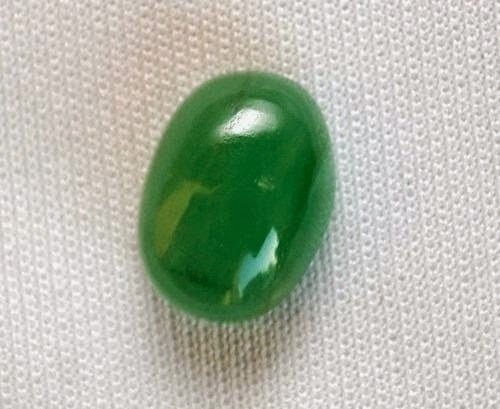 Green Jade is perfect for keeping a venture on course, a project on schedule, and life on track. Lighter Green crystals promote spiritual growth and renewed commitment to a higher purpose. Those of a darker hue are talismans of physical growth and strength, and safety in travel. Olive Jade combines the green rays of growth with the yellow rays of pure sunshine, a time of development, strength and maturity. It enhances our receptiveness to new meanings and ideas, and lights the path to wisdom and understanding. It is a talisman of the search for knowledge and enlightenment. In lighter shades, Olive Jade provides the perseverance needed in our quest for understanding the natural universe, efforts that require deep concentration, determination, and endurance for mental challenges. In deeper tones, Olive Jade is a "Study Stone," aiding us in the long quest for a higher state of understanding or awareness. It is excellent for achieving goals that need deep constancy and long-term purpose - not wild, exuberant growth, but the slow, steady development and deep caring of a life's calling. Olive shades of Jade are particularly conducive to meditation. Prayer beads or a beaded necklace works well. Finger the beads, one by one, and for each recite a rhythmic slow four- or five-word phrase or mantra, such as "May all be at peace." Go around and around the beads until you are in a state of deep relaxation.